CTSpec - Web is a secure, high performance web application, accessible at all times, that allows to receive, centralize, store, search, view, share and download inspection data using a secure web application. 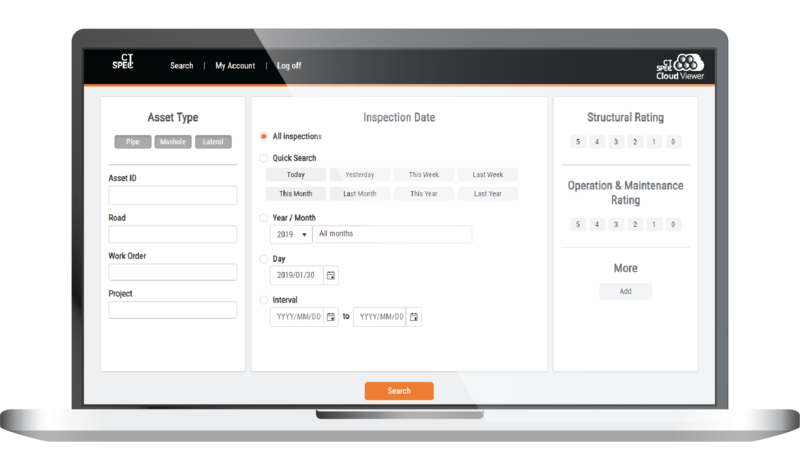 This online solution simplifies the sharing of inspection documents throughout the company and its customers. As it is transferred daily by subcontractors, the data is simultaneously available via CTSpec - Web to all authorized users who need to view them in real-time using an online URL address. This eliminates the need for HDD or memory sticks. Users can search for pipes, manholes and laterals using criteria such as asset number, location of the street, inspection dates, or operational notes. Once found, inspections are listed. CTSpec Web allows users to choose a specific inspection and view related videos, images, and observations, as well as view inspection details. If necessary, CTSpec Web will allow you to share a specific inspection with someone else, without that person needing to connect to the Web platform.